His faith was unshaken in you O Word. In the Fourth Year of the Persecution of our Days (A.D. 306). It was in the fourth year of the persecution in our days, and on Friday the twentieth of the latter Teshri:* it was on this same day that the chief of tyrants, Maximinus, came to the city of Caesarea. And he made a boast that he would exhibit some novel sight to all the spectators that were assembled together on his account; for that was the same day on which he celebrated the anniversary of his birthday. And it was requisite upon the arrival of the tyrant that he should exhibit something more than what had ordinarily been done. What then was this new spectacle, but that a martyr of God should be cast to wild beasts to be devoured by them. While of old it had been the practice upon the arrival of the emperor that he should set before the spectators competitive exhibitions of various forms and different kinds, such as recitation of speeches, and listening to new and strange songs and music, and also spectacles of all sorts of wild beasts, and likewise that the spectators might have much delight and amusement in a show of gladiators. It was therefore requisite that the emperor at this festival of his birthday should also do something great and extraordinary, for at all the previous exhibitions which he had furnished for them he had not done anything new. 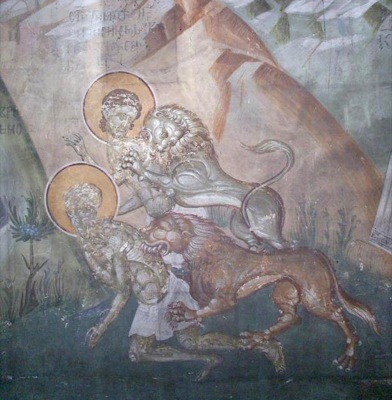 So that -- what was at once a thing desired by himself, and acceptable to the wicked tyrant -- a martyr of God was brought forth into the midst, adorned with all righteousness, and remarkable for the meekness of his life; and he was cast into the theatre in order that he might be devoured by the wild beasts. His name was Agapios, respecting whom, together with Thekla, an order had been given that they should be devoured by wild beasts. The fair name of Theckla has been already mentioned in another chapter. They therefore dragged the blessed Agapios forward, and took him round about in mockery in the midst of the Stadium. And a tablet, with an inscription upon it, was carried about before him, on which no other accusation was exhibited against him, but this only -- that he was a Christian. And at the same time also a slave, a murderer, that had killed his master, was brought forward, together with the martyr of God, and they both received equally one and the same sentence. And very closely did this passion resemble that of our Savior; for while the one was to suffer martyrdom for the sake of the God of all, the other also was to be put to death for the murder of his master; and one and the same sentence of evil went forth against both of them without any distinction. And the judge in this case was the governor Urbanus, for he was still governor in Palestine. But when Maximinus came to be present at this spectacle which has been described above, as if on account of the promptitude of Urbanus, he increased his power of evil, and liberated from death that murderer which had slain his master, and put him beyond all torture; but as for the martyr of God, he took delight in looking on with his own eyes while he was being devoured by the savage beasts. When therefore they had led the martyr Agapios round about in the Stadium, they asked him in the first place if he would deny his God, but he cried out with a loud voice and said to all those who were assembled together, "O you who are looking on at this trial in which I am now placed, know that it is not for any evil crime which I have committed that I am brought to this trial, for I am a witness of the true doctrine of God, and I bear testimony to you all, in order that you may have knowledge of the one true God, and of that light which he has caused to arise, that you may know and adore Him who is the creator of the heavens and of the earth. And all this which is come upon me for his name's sake, I receive with joy in my mind; for they have not brought me to this place against my will, but I desire this of my own free choice, by which I stand even unto death. Moreover, I am contending for the sake of my faith, that I may afford encouragement to those who are younger than myself, that they too may despise death while they follow after their true life, and may disregard the grave in order to obtain a kingdom; that they should make light of that which is mortal, and keep in their recollection the life of the Giver of life, nor have any dread of punishment which is momentary, but be in fear of those flames of fire which are never quenched." * Teshri is equivalent to November. ** Saint Agapios is also commemorated on August 19th with Saints Timothy and Thekla.